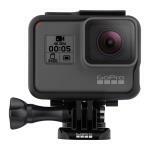 According to the market buzz, this is a BIG step up for the Go Pro. How big? Let's find out in this buying guide. Download the free Go Pro and Quik mobile apps and take advantage of QuikStories, where you can send footage to your phone and let the app automatically edit it into the breath-taking video. Much of the buzz around the Hero6 Black is around this feature. Much of Go Pro's "big step up" has to do with 4K60 and 1080p240 video, capable of delivering twice the performance of its predecessors. The Go Pro Hero 6 Black also promises the best image quality ever, thanks to a brand new GP1 chip which has been optimised with this Go Pro model in mind. Smooth, stable footage really enhances the viewing experience, and the Go Pro Hero 6 Black delivers there as well, with what they call their most advanced video stabilisation yet. With 5 GHz Wi-Fi, copying video and photos to your phone is a much faster experience: 3 x faster offload speeds to be precise. Another improvement in the Hero 6 Black is enhanced image quality for both video and photos in low-light. These upgraded and updated features are housed in a tough and strong body. As a Go Pro is often used in and around water, you'll be pleased to know the Hero 6 Black is waterproof up to 10 metres.